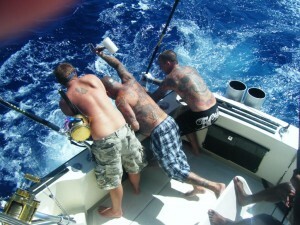 Kevin & the Baltazars joined us to deep sea fishing the beautiful blue Hawaiian waters today aboard the Ruckus. They brought in 3 Mahi Mahi and 2 Aku. Excellent job guys! 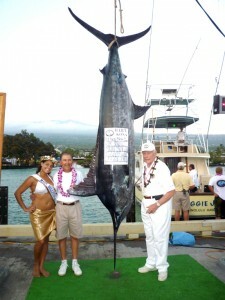 Maggie Joe has been busy the past month participating in several billfish tournaments on the Big Island. This 567 lb Pacific Blue Marlin caught by Sam Spinello ended up giving Maggie Joe a second place finish at the prestigious HIBT. Early in Day Three of the Hawaiian International Billfish Tournament, the Aussies from Fremantle Sailing Club A Team fishing aboard Real Pleasure hooked-up just outside Kailua Bay. Veteran angler and team captain Mark Maher, an IGFA representative, fought the good fight for nearly six hours before losing the fish estimated in excess of 400 pounds. 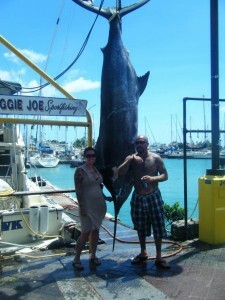 “It was about the same size as the Pacific blue marlin boated yesterday. Those 400-pounders are very active this week,” HIBT founder Peter Fithian said. Before the mid-morning radio round-up, one of three daily team call-ins, anglers had tagged and released 12 Pacific blue marlin. With six more hook-ups announced over the airways before noon, anglers representing enthusiastic teams from around the world were on high alert. All but five of the 41 teams have now posted points on the HIBT scoreboard. Angler and team captain Sam Spinello boated a 567 pound Pacific blue marlin, propelling the team into first place. Malibu Marlin Club hooked up in Uniform, the fishing area way south near Hookena. 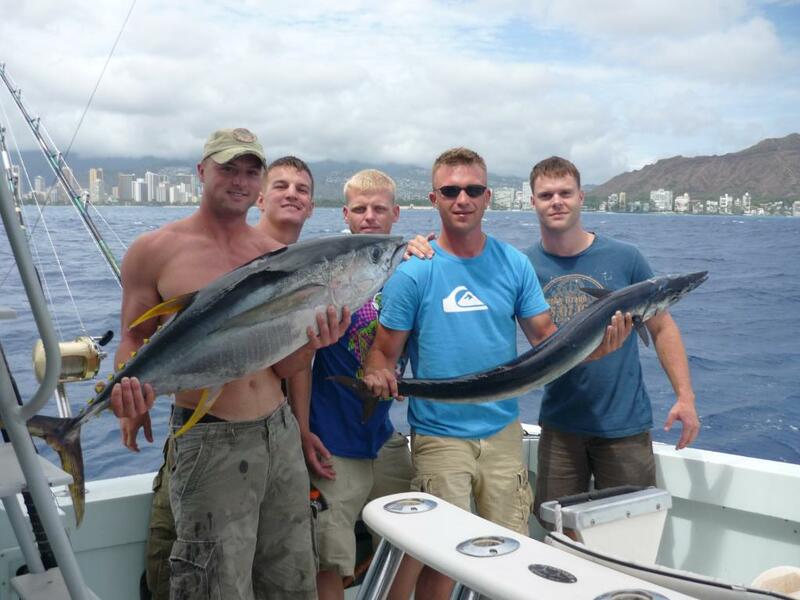 Tom, Dustin, & Quinn caught two 20lb onos today while deep sea fishing out of Honolulu while on the Ruckus. Great job guys! 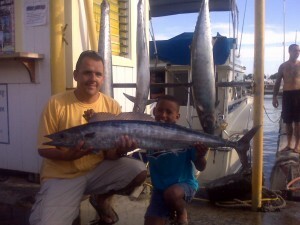 Luke caught this 43lb shibi sportfishing on the Ruckus today. With a beauty like this Captian Jason and Mate Matt had to get in on the photo action. 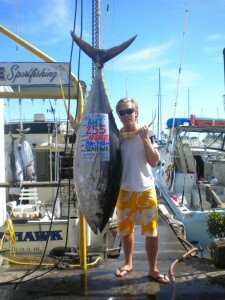 Thomas Batkunas also brought in this 30lb ono while fishing Hawaii’s beautiful water. 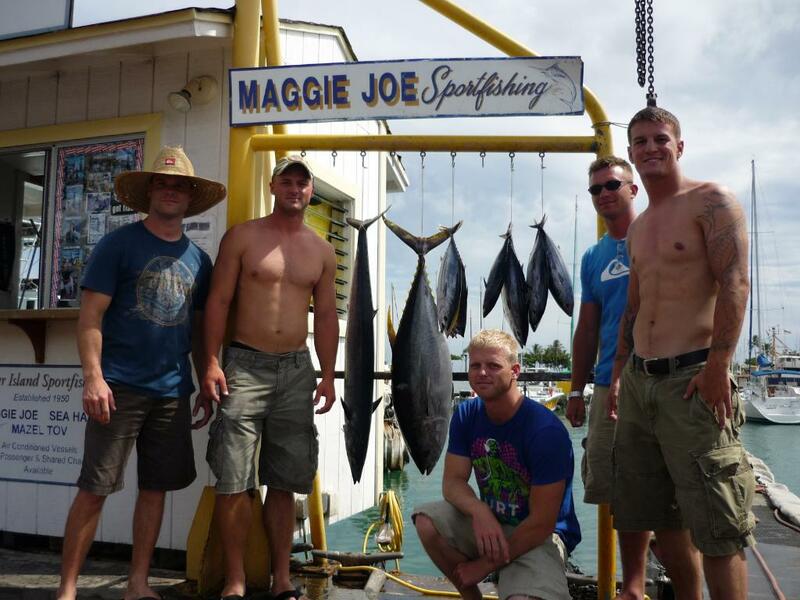 The whole group is seen above displaying their days catch. Great job guys! 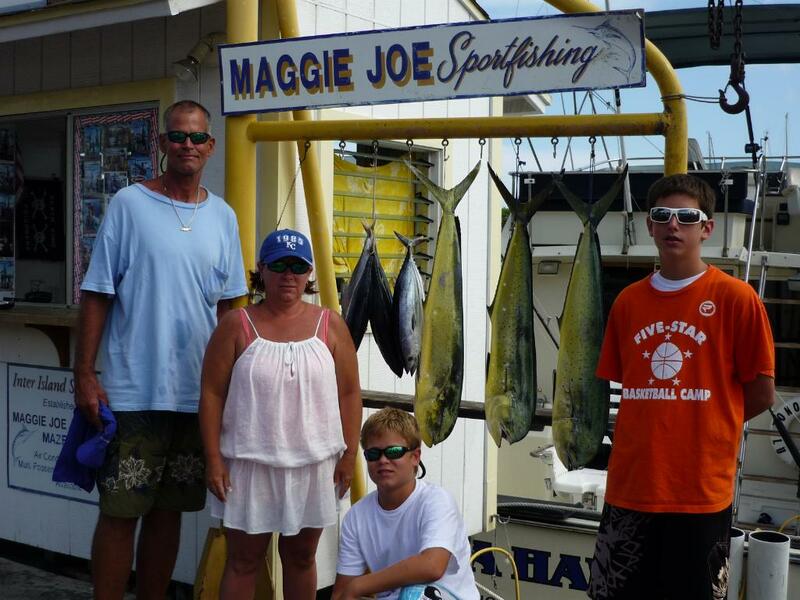 The Strayer family joined us for some deep sea fishing on the Ruckus today. 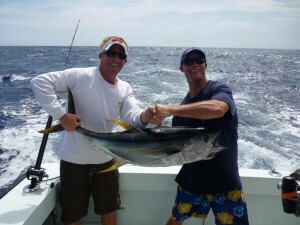 They brough in 3 beautiful mahi mahi & some aku off the isalnd of Oahu and are seen here proudly showing off their catch. Great job guys! We enjoyed having you on board. 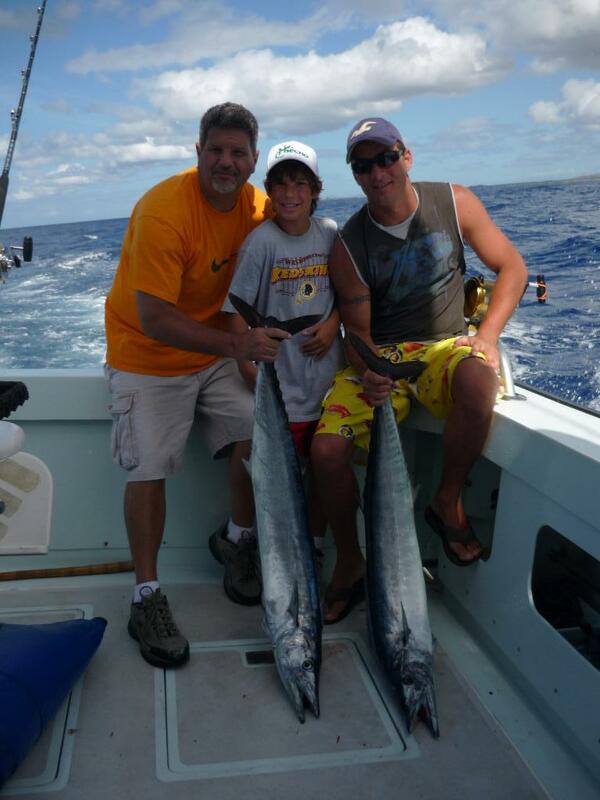 J.J. Knabb & Family joined us aboard the Ruckus today. They may not have brough in the biggest fish we’ve seen, but they did a great job of grabbing these aku. 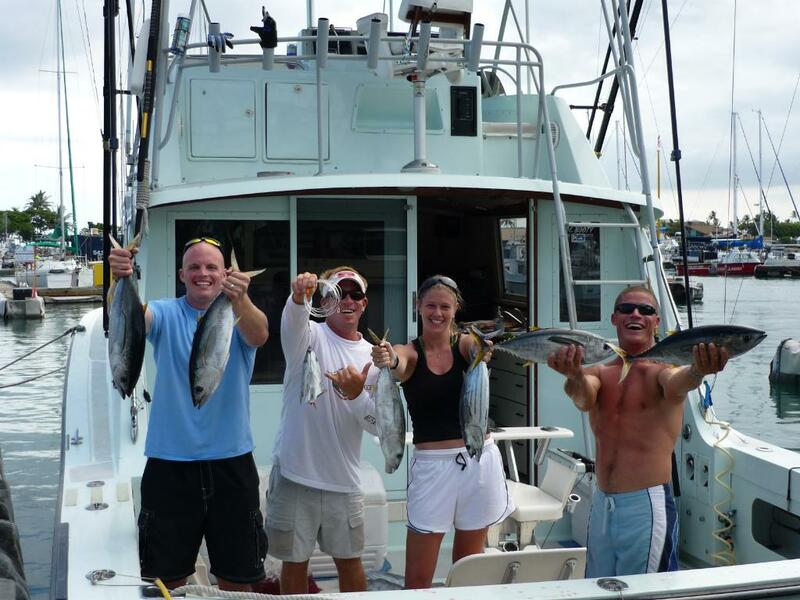 We had a great time with you and can’t wait to see you deep sea fishing in Hawaii again soon! 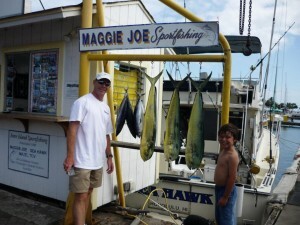 On 7/19/09 Tony and friends chartered the Sea Hawk for a full day deep sea fishing trip. 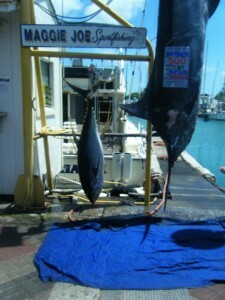 The trip proved to be eventful as we were able to bring in a nice size Ahi and a 606 lb Blue Marlin. Just another day here in paradise doing what we do best. Tony, thanks again for joining us on the Sea Hawk and we can’t wait to see you back again the next time you are on Oahu. Above is our new updated Oahu deep sea fishing video. Check it out and see what you’re missing out on! 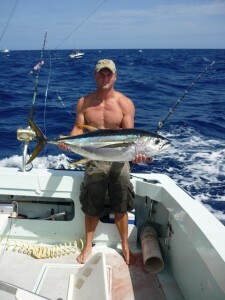 Andreas caught this 255 lb beast of an Ahi with us on 7/16/09 while deep sea fishing on the Sea Hawk off Oahu. Andreas, we had a blast out there on the water with you and look forward to seeing you again! Mahalo! 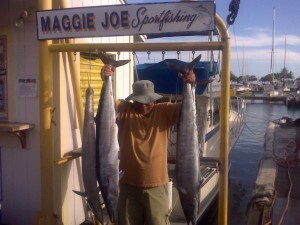 3 Ono’s caught on 6/27/09. 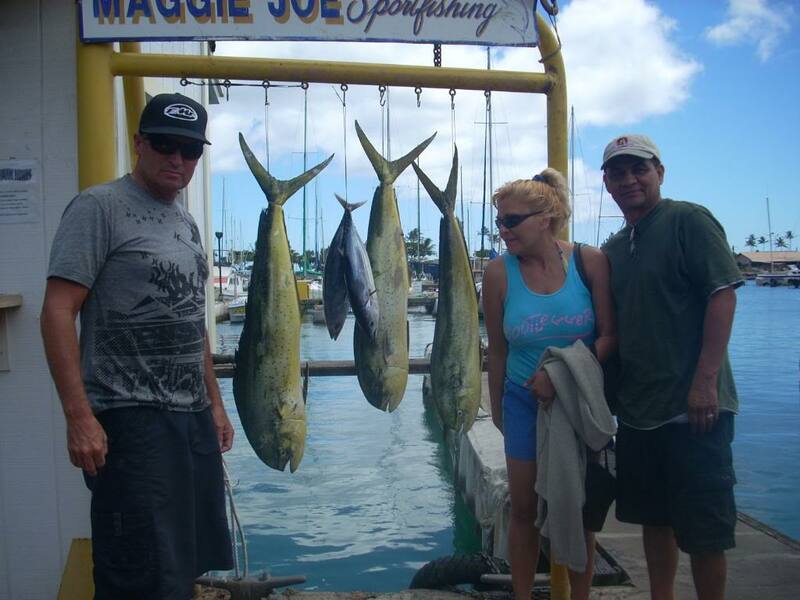 Just another fun filled day of deep sea fishing here in Honolulu, HI with Maggie Joe Sport Fishing!